Some pause for thought before the madness of tonight’s Libertadores final: One of the greatest players in arguably the greatest Argentine club side of them all passed away today. Néstor Raúl ‘Pipo’ Rossi played number 5 (a combination of a ‘holding’ midfielder and deep-lying playmaker – think Mascherano or Gago in the modern game) for River’s legendary La Máquina. Rossi excelled in a River side which a young Alfredo Di Stéfano was on the mere fringes of in the 1940s. He made his Primera División debut on the 25th of June 1945, coming off the bench during River’s 2-0 win over Racing. He won domestic titles in 1945 and ’47, and with the national side claimed the Sudamericano in Guayaquil, Ecuador, also in 1947. On the 7th of August 1949 he played his last game for River before moving with Di Stéfano to Millonarios of Colombia, where he won four league titles. Rossi returned to River in 1955, playing on until 1958 and starring again for the national side which won the Sudamericano of 1957, held in Lima. 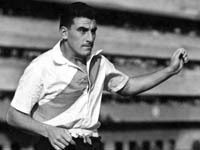 After his final appearance for River on the 4th of July 1958 – his 156th for the club – he moved to Huracán and began to wind down his playing career. As a manager, he won the 1962 championship and the ’74 Metropolitano with River, as well as giving another great 5 – the young Daniel Passarella – his first-team debut. Argentina’s lack of presence at the first post-war World Cups, and their ill-organised showing in Sweden in 1958, mean that Rossi is not a name universally known outside the country. But Argentines everywhere – and River fans especially – will today be remembering one of their all-time greats. Pipo Rossi was 82 years old.